The Return of Shelby the Swamp Man is an American 60 minute reality television series, which kicked off on October 11, 2018, on History and is broadcast every Thursday at 22:00. The show is currently in its 1st season. 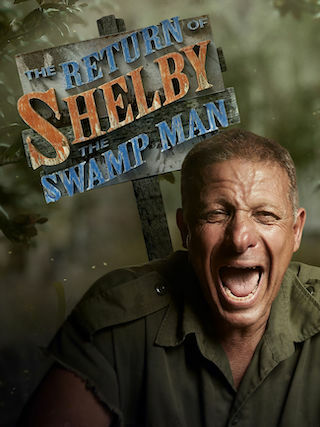 History is yet to announce the renewal of The Return of Shelby the Swamp Man for Season 2 as well as its cancelation. Sign up to track down the show's status and its release date. Deep in the Louisiana Bayou lives a legend. Shelby Stanga's known as the Swamp Man  and he's been ruling these parts for years. He earned a fortune hauling valuable cypress out of the muddy waters and won a reputation as King of the Swamp. But a couple years back, it all fell apart. His orders dried up, he lost everything and retreated deep into the swamp. But life in the bayou has been turned upside down. Record flooding has destroyed homes and businesses and now, Shelby's friends and neighbors are in trouble and need him more than ever. So the Swamp Man is springing into action. He's on a mission  to help get his fellow swampers back on their feet and get himself back on top in the process. But he won't be doing it alone  he's bringing along his new protégé Angela, and she'll need to be a quick learner because the Swamp Man will put her through the ringer. But Shelby's not stopping there. He's pulling out every toy he's got up his sleeve  including the biggest of em all  his forty ton barge he's lovingly nicknamed "The Leviathan."